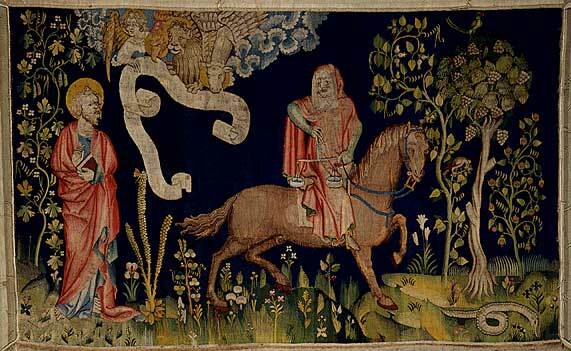 Paintings, illustrations, and tapestries from the late Gothic and Early Renaissance periods. Mainly stylized mushrooms, some not easy to find. Here, we include only works with incontrovertible images of mushrooms. There are many other possible representations of mushrooms or mushroom-like objects that are a subject of specialized scholarship. Medium: Egg tempera on oak; size 57 x 29.2 cm. Anonymous, German School. 15th-16th century? Anonymous, Italian School. 14th century? Reference: Bovey, A. Tacuinum sanitatis: an early Renaissance guide to health. London: Sam Fogg, 2005. Mushroom description: Vendor and customer, with a basket that may contain mushrooms and holding what may be a stylized mushroom. Medium: Sculpture; Size: 74 x 25 x 18 cm. Reference: Portilla, MJ. Catalogo Monumental de la Diócesis de Vitoria. Vol. VI. Vitoria: Caja de Ahorros Municipal de Vitoria. 1988. Note: Luis Montes reports that a similar statue is in the portico of the Colegiata de Toro (Zamora, Spain) but the mushroom-like object cannot be interpreted with assurance because of its unique rectangular scales. Medium: Polychrome stucco sculpture; size: 107 x 51 x 30 cm. Mushroom description: Madonna standing on center pillar, holding the Christ child in her right arm and a mushroom on her left arm. The mushrooms looks like the one in [a] and [b]. Original source: 14th century. Bataille did the weaving and de Bruges the painting. The entire tapestry is 140 meters long. Begun around 1375 and completed seven years later. Medium: Oil on panel; size: 135 x 100 cm. Mushroom description: An object resembling a light-colored bolete with a bulbous stem can be seen near the right edge of the middle panel. Further identification seems unwise. Reference: Alpatow. Geschichte der Kunst II, Tafel IIIa; Bauer et al. Der Fliegenpilz, S. 111 (Auschnitt, black and white). Cologne. 1991. Pacht. Altniederländische Malerei. Farbtafel 11 (in color) and p. 105, figure 84, black and white. Munich. 1994. Mushroom description: Marasmius sp., Coprinus cf. comatus and Lycoperdon sp. Medium: Tempera on wood; size: 13 x 71 cm. Location: Galleria degli Uffizi, Florence. Painted around 1485 for the Badia, Fiorentina. At the Uffizi since 1935. Reference: Einaudi, Luigi and Buongoverno (II), Laterza-Collana. Collezione Storica. 2004. Reference: Platearius, Mattthaeus. The Book of Simple Medicin. Barcelona: Moleiro Editor, S.A. 2006. Original source: Ms. Fr. Fv VI #1 fol. 168v. Mushroom description: Man tilling soil with elephant, deer, and beehive. Three campanulate, stylized, light-colored mushrooms are on a mound. Original source: Ms Fr. Fv#1 fol. 162 r.
Mushroom description: Three campanulate mushrooms are sticking out of the trunk of hazelnut bush on right. Original source: Fr. F. VI#1 fol. 163v. Mushroom description: A bush on the left has four clumps of, perhaps, jelly fungi. Medium: Oil on wood panel, 177 x 73 cm. Mushroom description: The floor of the forest contains some 300-600 white stalked specimens that may well be mushrooms. Some are in circles. Reference: Whistler, C. The Hunt in the Forest, 2001. Oxford: Ashmolean Museum. Schaechter, E. “Mushrooms” in an early Renaissance painting: Uccello’s ”The Hunt in the Forest. 2005. Mycologist 19: 150-151. Reference: Pächt, Altniederländische Melerei. Munich. 1994. Gemäldegalerie Berlin. 200 Meisterwerke, Berlin. 1998.